Label Aire 3120 semi automatic table top wraparound / partial wrap labeler and Norwood hot stamp coder. Labels up to 5" wide. Containers from 5/8" to 7" in diameter. Foot pedal activated. Label Aire Model 3115 NV 1500 7"x16" RH pressure sensitive, wipe on spot labeler rated from 600 to 1,500 linear inches per minute, with number of product – depending on materials and application. Equipped with swivel mounted bracket with accuracies of +/- 1/32", and has 1" to 10" adjustable stroke with maximum 20" OD label roll and 20" OD label rewind with 3" ID cores and has stepper drive, with touch pad controller with R3 digital display. Mounted on hand crank height adjustable T-stand with casters. Can be converted to do left or right hand use as well as doing top, side or bottom labeling. 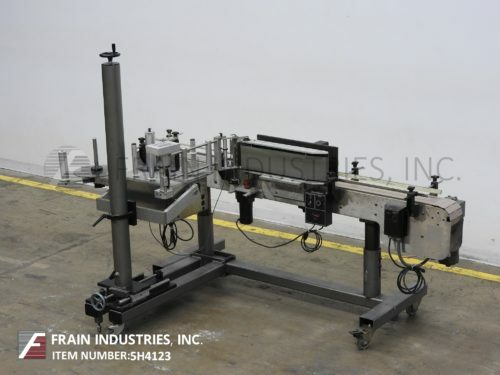 Label Aire Model 3114 NV 1500 7"x16" RH 1-10"ST pressure sensitive, blow tamp spot labeler rated from 600 to 1,500 linear inches per minute, with number of product – depending on materials and application. 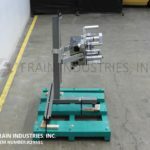 Equipped with swivel mounted bracket and blow tamp label head with label size range: 3/4" to 5" in Length; 3/4" to 4" in Width, with accuracies of +/- 1/32", and has 1" to 10" adjustable stroke with maximum 20" OD label roll and 20" OD label rewind with 3" ID cores and has stepper drive, with touch pad controller with R3 digital display. Mounted on hand crank height adjustable T-stand with casters. Can be converted to do left or right hand use as well as doing top, side or bottom labeling. Label Aire 2114ST automatic pressure sensitive tamp labeling system. 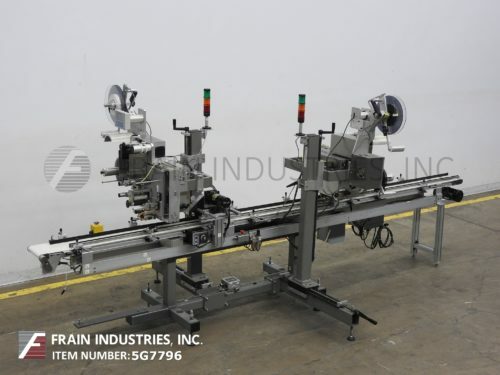 System consists of 2114ST labeling head mounted over 96" long x 4" wide conveyor. Labeling head is a stepper driven pressure sensitive tamp labeler with speeds of 500 to 1250 ft/min. Label dimensions: up to 4" in Width; up to 5-1/2" in Length. Placement accuracy to +/- 1/32". Equipped with 12" diameter foam applicator wheel and variable speed adjustment for applicator wheel and conveyor speed. Labeler mounted on 3-axis stand for complete adjustability. Maximum roll diameter of 12" on a 3" ID core. Dual Label Aire, Model 3114, pressure sensitive, tamp on spot, around the corner, tamper evident labeling system. Rated from 600 to 1500 linear inches per minute with number of product – depending on materials and application. Equipped with (2) swivel mounted bracket label heads, 12" OD label roll and 7" OD powered label rewind, (2) 1" wide x 14" long overhead product hold down belts and (2) side rollers to fold label around corner. Stepper driven has touch pad controller with digital display and statis light bar. Mounted on 8" wide x 165" long belt conveyor with casters. Label Aire Model 2114M, pressure sensetive, tamp on, bottom labeling system rated from 500 to 1250 linear inches per minute, with number of labels – depending on materials and application. Label size range: 3/4" to 4" in Width; 1/4" to 5-1/2" in Length with label placement accuracy: +/- 1/32". Equipped with (2) 40" long x 2-1/2" wide side product gripper belts with motor drives and vari speed controller. Microprocessor with low label sensor, label counter and label placement controls, auto rewind, statis light and mounted on stationary frame. Roll specifications: Maximum roll diameter of 12" on 3" core. Tamp/blow label applicator capable of dispensing 1,600” of web per/min with a maximum label width of 4” and label length dependent on application. Label accuracy up to +/- 1/32”. Features include 20" extended diameter unwind clearance, stepper driven motor, power unwind/power rewind and menu driven microprocessor to allow repeatable settings. Tamp/blow applicator stroke is approximately 3". Additional feature includes a T-base stand with 36" vertical adjustment and leveling legs.